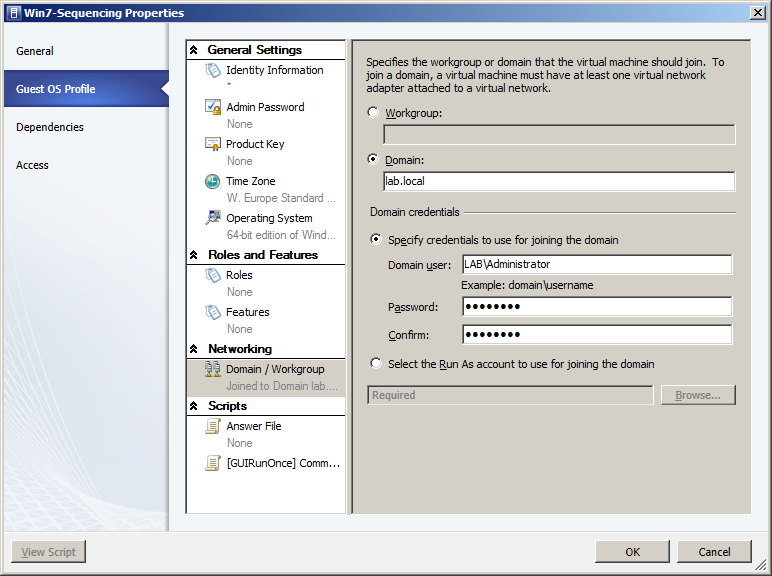 The only thing is, that you can’t define this in the VMM Administrative Console. Below is a screenshot of one of my Guest OS Profile settings. These are all the settings you can set through the console in regards of domain information. But if you use the CmdLets which come with the Administrative Console installation, you can define the default OU. To do this, start the “Virtual Machine Manager Command Shell” from the start menu (it’s in the VMM 2012 start menu folder). This will load the VMM PowerShell module. Get-SCGuestOSProfile -Name "Win7-Sequencing" | Set-SCGuestOSProfile -DomainJoinOrganizationalUnit "OU=Virtual,OU=Computers,OU=Lab,DC=lab,DC=local"
If you now use this Guest OS Profile when deploying a virtual machine from a template, your machine will be joined to the domain and the machine account will be put in the given OU. Great post! I was looking to do the same thing and found a solution using an unattend.xml file. Keep up the great work! Very useful. It taught me to start using SCVMM PowerShell instead of relying on the GUI.